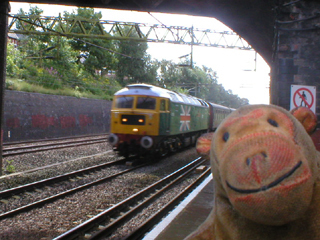 Mr Monkey had found out that 60009 Union of South Africa was going to haul the North Wales Coast Express from Crewe to Holyhead via Stockport and Manchester. He realised that the train would have to go along tracks not too far from his house, and he really wanted to see an A4 going at a reasonable speed, so he set about persuading his humans that they wanted to get up early on a Sunday morning to help him achieve this ambition. 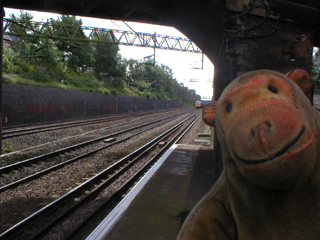 His monkey powers proved successful and on August 5th Mr Monkey and his humans caught a train to Heaton Chapel, where they lay in wait for the rail tour. 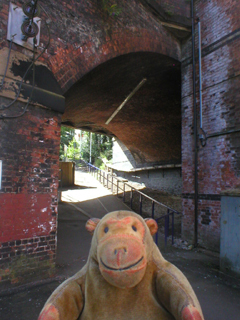 Mr Monkey waited by one of the arches supporting the road over the station, so that the sun wouldn't shine into his little eyes. At more or less the right time, Mr Monkey saw a train heading up the central track, and assumed it was the North Wales Coast Express. He thought it was a little odd that the train coming towards him didn't sound like it had a steam engine hauling it, and that its front was yellow. When it got closer it was obvious that whatever the train was hauled by, it wasn't a steam locomotive. Mr Monkey found out much later that the Union of South Africa had had a problem with its superheater, which could only be replaced when the locomotive was cold. This obviously meant that 60009 couldn't run that day, so when it went past Mr Monkey the train was hauled by 47580 County of Essex, a preserved Class 47 diesel. Apparently a crew got 6233 Duchess of Sutherland ready to pull the train from Chester, but it got entangled in missing paperwork and Network Rail's reluctance to let steam engines on their tracks when the Olympics were on, so the trip was diesel hauled to Holyhead and back. Mr Monkey hasn't got anything against Class 47 locomotives, or even diesels in general, but he had set his heart on seeing an A4 moving at speed, and the County of Essex really wasn't the same thing at all.